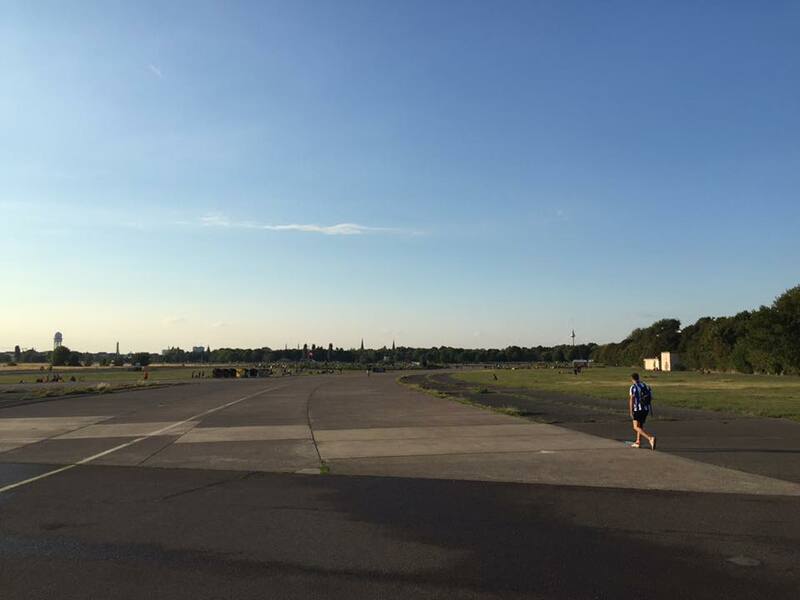 The airport Berlin-Tempelhof (german: Flughaven Berlin-Tempelhof, ICAO: EDDI, until 1995: EDBB) was one of the first airports in Germany, being established in 1923. 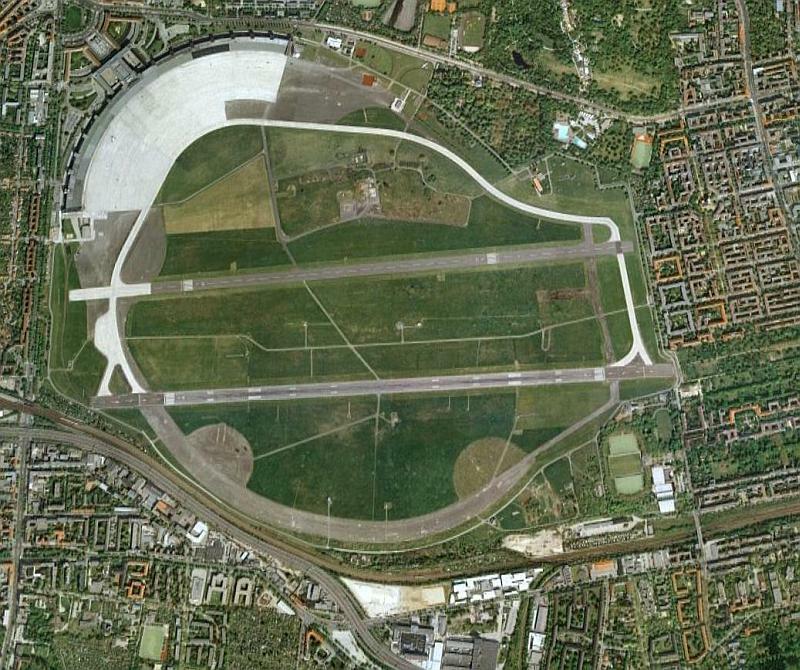 The area on which the airport was built used to be an exercise field of the German Army. In 1909 Orville Wright used the field to set up his starting equipment to perform some flight demonstrations and break some records in flight. 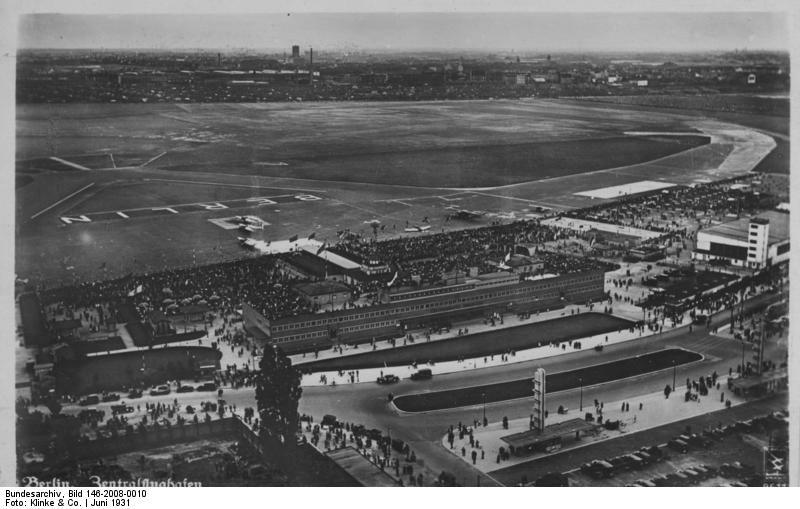 In 1922 the field was planned to become an exhibition area, but the Magistrate of Berlin was convinced it was more suited to become the new central airport. In a demonstration of the possibilities, 5 passenger aircraft made a spectacular nighttime landing paving the way for the airport. In February 1923 the first route was opened between Berlin and Munich, flying four passengers per flight. In October the airport was officially opened when ownership was transferred to Junkers Luftverkehrsgesellschaft and Deutsche Aero-Lloyd. By means of a starting fund of 500,000 Reichsmark the Berliner Flughafen-Gesellschaft mbH was founded in 1924 and the airport was immediately expanded by the construction of an airport terminal, 5 large Hangars and other facilities. Junkers Luftverkehrsgesellschaft and Deutsche Aero-Lloyd merged to form Deutsche Luft Hansa in 1926, and the first night route (to Moscow via Königsberg) was opened. The same year 3 Junkers G-24 left Tempelhof in an attempt to fly to Peking, a flight that would ultimately take one month and one week to complete. 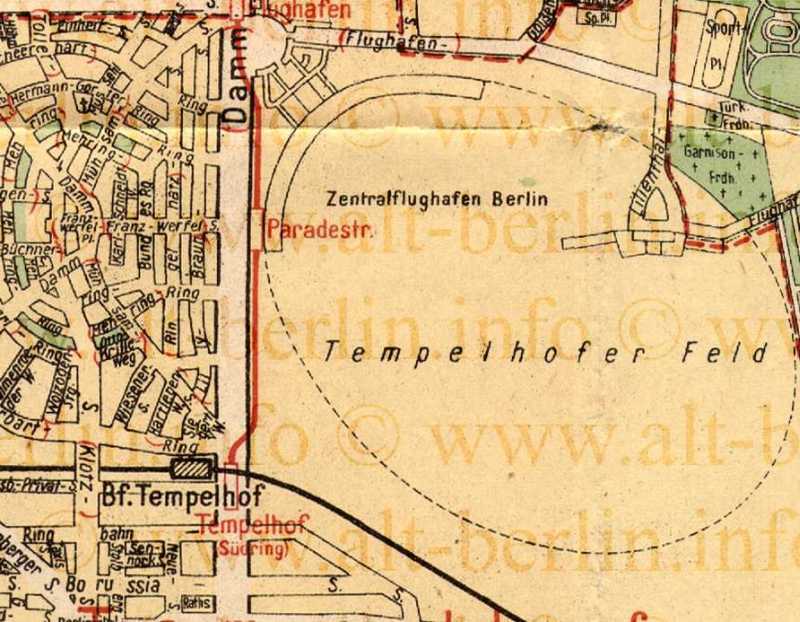 Between 1927 and 1928 the airfield was modified to allow nighttime flying, flying between Berlin and Zürich took 5 hours 15 minutes and the first East-West transatlantic flight started from Tempelhof in March 1928. In 1931 the first tri-engined Ju-52 was introduced to the world and the Graf Zeppelin makes the first transatlantic return trip. 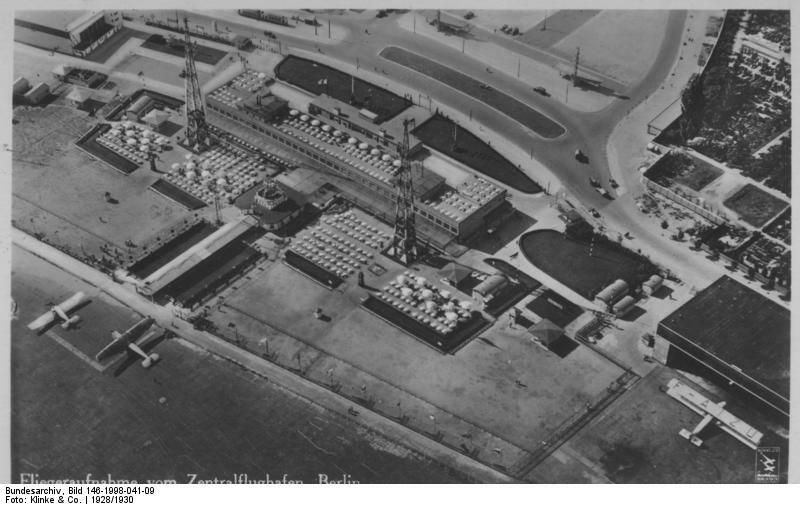 Professor Ernst Sagebiel planned a new terminal building in 1934. 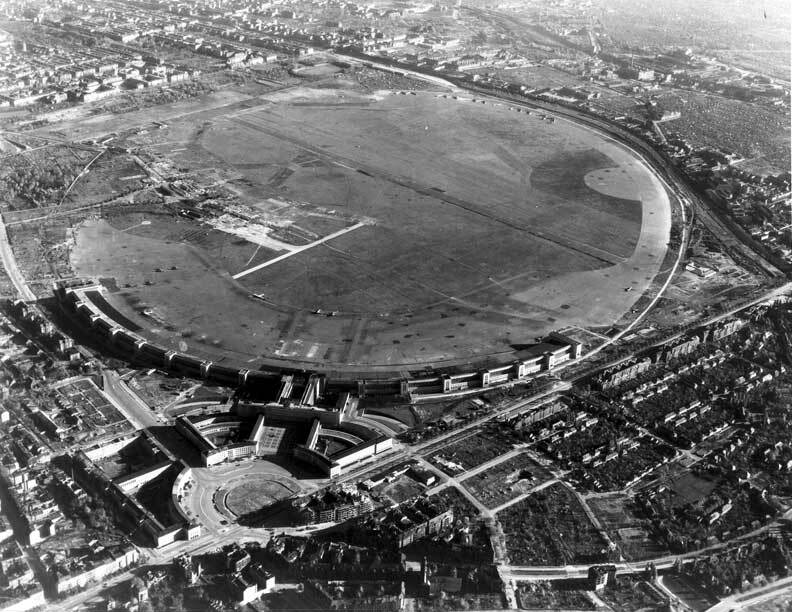 The XIth Olympiad took place in Berlin in 1936, bringing many athletes, reporters and tourists to Berlin via Tempelhof. Female aviator Hanna Reitsch flew the new Focke-Achgelis FW-61 helicopter in 1937, whilst setting a record airspeed of 109KM/h. The first transatlantic return flight Berlin-New York-Berlin landed 14 August 1938, a Focke-Wulf Condor piloted by Alfred Henke. Lufthansa set up offices in the partially completed new teminal building in April 1939. During the Second World War the airport played a minor role, having been assigned a role as an assembly line (using forced labour) for Ju87 and Ju88 aircraft. The last aircraft (a Lufthansa Ju-52) to depart from the Nazi capital took off on 22 April 1944 for Warnemünde. The airport was taken by Soviet troops on 28 April, raising their flag next to the Reichsadler (the Eagle that symbolises the German nation). After the Potzdam Conference the Soviets handed over the airport to the US-Allied forces. On the last day of November 1945 the Allied Control Board guaranteed the western alllies unhindered passage over Soviet controlled terrain through three air corridors: to Hamburg, Hannover and Frankfurt. On 18 May 1946 the first civilian aircraft to land at Tempelhof after the war is a DC-4 of American Overseas Airlines. 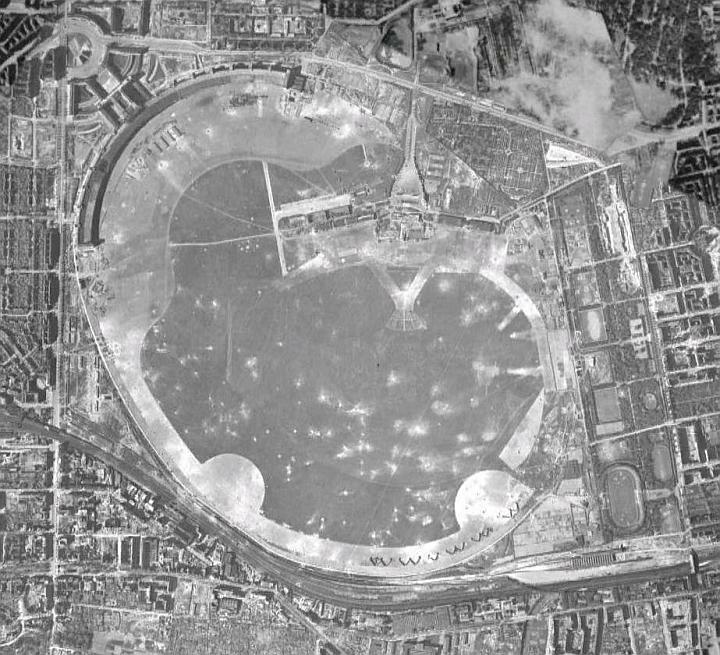 When the Berlin Blockade began in 1948 Tempelhof became one of three hubs from where the city received its supplies (the others being Gatow and Tegel). Between 26 June 1948 and 12 May 1949 aircraft started and landed every 90 seconds. American Pilot Gail Halvorsen made it a habit to drop small packages with sweets for the children near the runway on his approach, earning him and the pilots that also adopted the practice the legendary nickname 'Raisin Bomber' (german: Rosinenbomber). In honour of the Alllied supplies Tempelhof received a memorial in front of the terminal building on the Air Bridge Square (german: Platz der Luftbrücke). 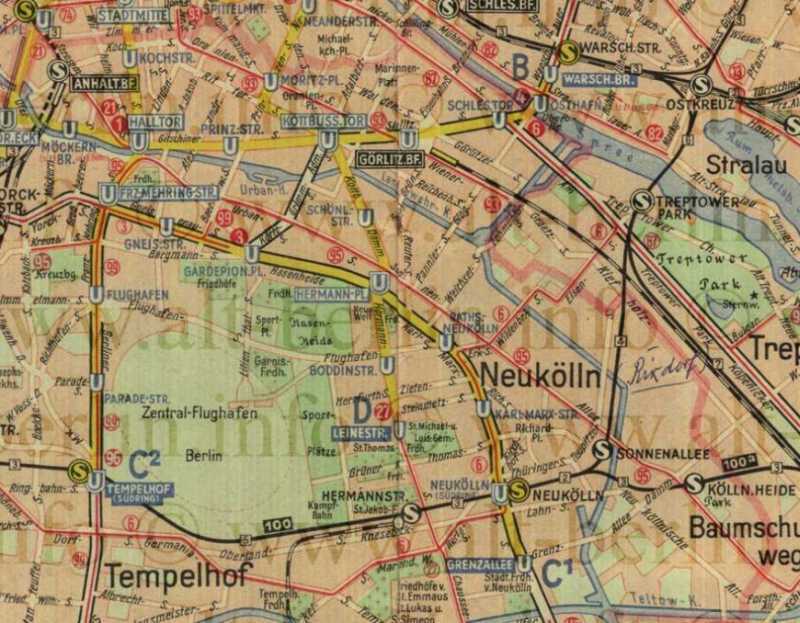 After the blockade the Berliners asked the Americans to allow a part of the airport to be used for civilian traffic. 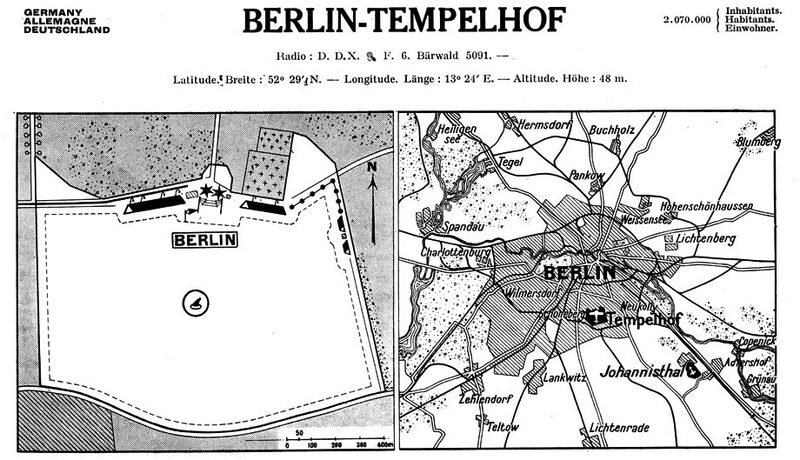 On 1 July 1950 the American High Commisioner allowed the Berlin Senate to use a part of Tempelhof as a civilian facility. On the southern part of the terminal building a small handlling facility was constructed, allowing a monthly capacity of 20,000 passengers. At the time the main hall (which served as the terminal later on) was still under construction and heavily damaged from the war. On 9 July 1951 the new terminal was officially put to use for the first time since construction began in 1936. The three western allied airlines PanAm, BEA and Air France shared the use of the airfield. Passenger traffic developed much faster than anticipated, in part because the airways formed the only way out of Berlin for refugees (who could not pass the DDR-checkpoints on the ground). As early as 1951 the airport broke the record year 1938 in numbers of passengers (320,000), rising to 650,000 in 1954. During the blockade, the airport had gained three parallel runways, but the middle one was broken up in 1957-58 while the other two were extensively repaired and lenghtened. 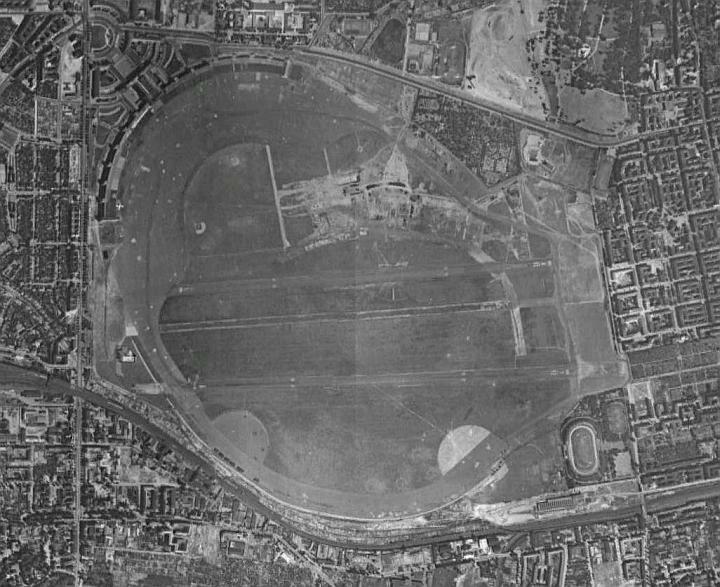 The north track developed into a 2093meters runway, whilst the southern one became of 2116meters length. By the late 1950s the available facilities were no longer sufficient to handle passenger traffic (by 1960 risen to 1.5 million a year). After negotiations with the USAF, facilities under military control were put to civilian use, including the main terminal building and entrance, the front airport square and office buildings. As a result the southern part was now used for civilian traffic, while the northern parts were military. 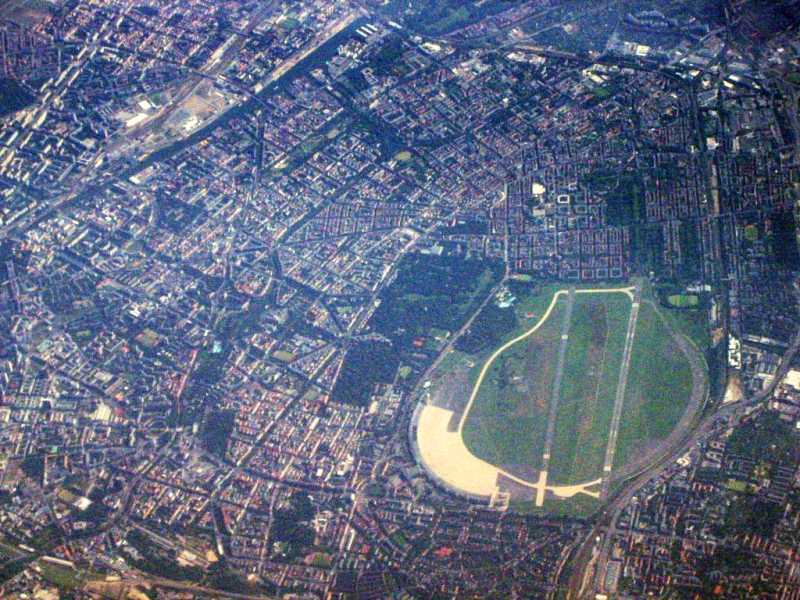 From 2 July 1962 the new facilities allowed Tempelhof to handle a maximum of 250,000 passengers a month. To reduce the monumental impression of the main hall entrance the ceiling was lowered, creating a visually inconspicuous entrance zone. The remaining 10 meter high space (known as Memorial Hall or Ehrenhalle in german) is not available to the public and only used for occasional tours. In the main hall the originally 19 meter high but very damaged ceiling has been replaced with a suspended panel ceiling hanging at 15 meters. Although Air France had moved its operations to Berlin-Tegel after the introduction of the jet powered Caravelle in 1960, capacity reached its limits in 1970. 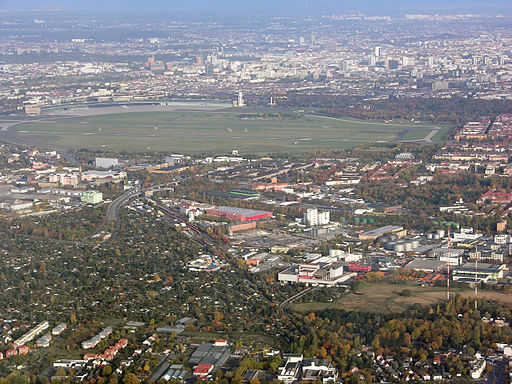 By moving charter flights to Tegel in 1968 and after countless small renovations capacity grew a little more, but it became increasingly clear traffic would have to move to Tegel. In the summer of 1975 the airport was closed to civilian traffic, and diverted to the former French airport Berlin-Tegel. In 1985 the airport was reopened to civilian business travel and smaller airlines. By 1990 the airport was handling over 400,000 travellers again. 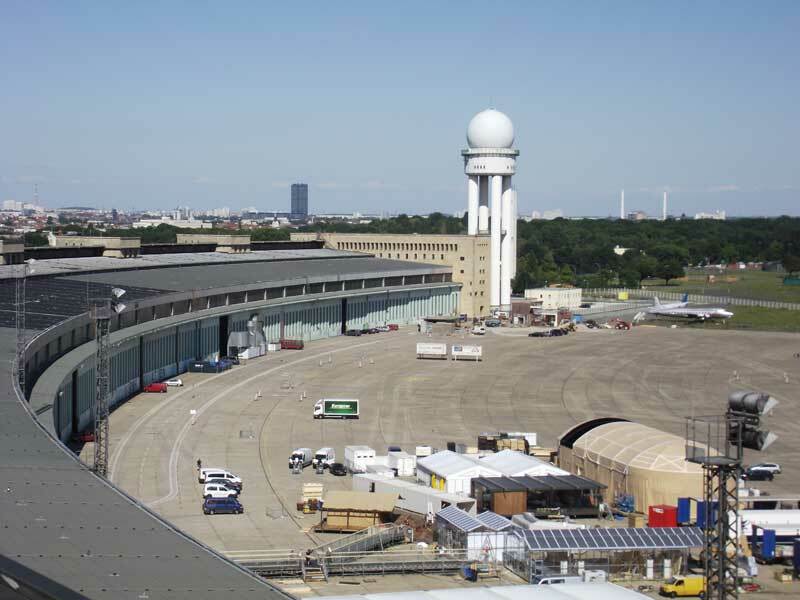 The US Air Force returned control of the airport to Berliner Flughafen-Gesellschaft in 1993. As a result of its fairly short runways the airport was limited in the size of aircraft that could use it and only narrow bodies used it frequently. The USAF only used Lockheed C-5 Galaxies at the airfield during 'Open Door' airshows and only two Boeing 747s ever landed at the airfield. Both belonged to PanAm: one in September 1976 (A Boeing 747SP) and one in June 1987 (747-121). 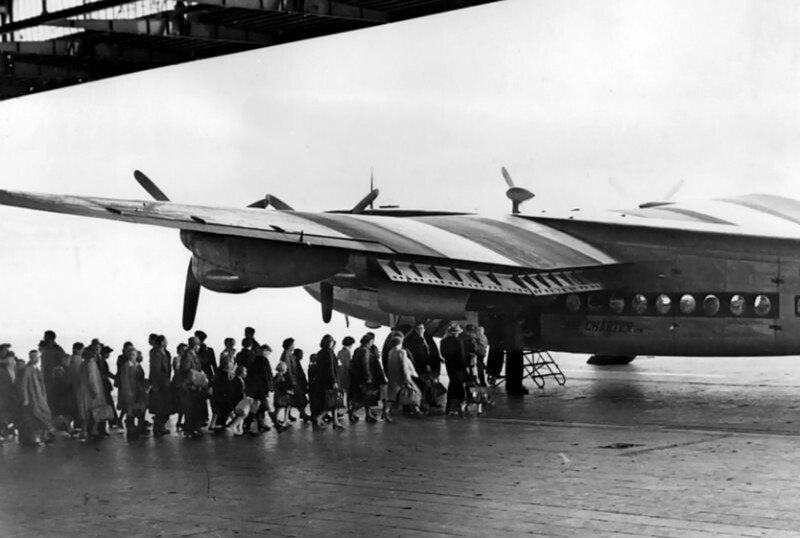 Because of their size all had to fly in and out without passengers, cargo or refuelling. 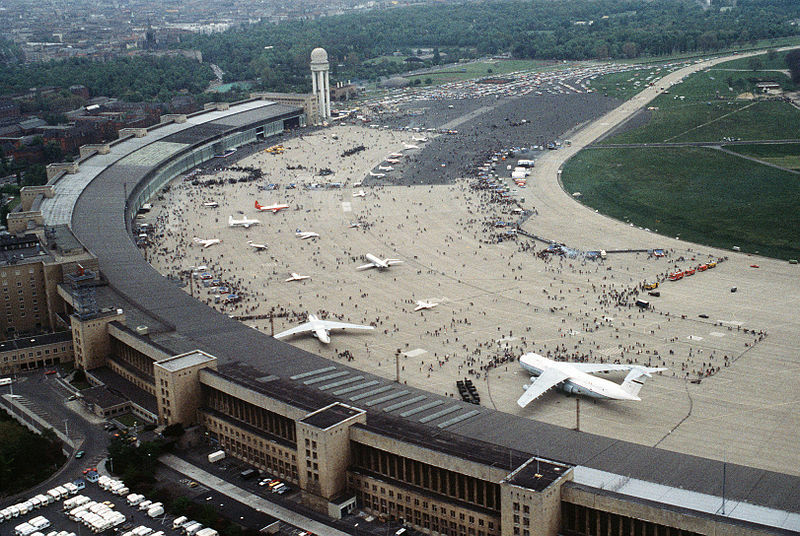 Shortly after reunification and return to German control in 1993, the Berlin Senate announced plans to close Tempelhof and transform it into a business, living, park and sports area. In September 2007 the airport handled its largest commercial passenger aircraft: an LTU Airbus A330 proved new technology allowed for the use of shorter runways. After a lot of legal proceedings a referendum was held in Berlin in 2008 on the matter. Although 60% of voters voted in favour of keeping the airport open, they represented only 21,7% of all people eligable to vote while 25% were needed. A second referendum was deemed unneccesary, and the airport was ordered to close on 31 Oktober 2008. The last charter and at the same time the last jet flight from Tempelhof (a Boeing 737 of Air Berlin) took off on 30 October 2008 at 22:12 hours, landing 22 minutes later at Berlin-Tegel. Five minutes later the last airline flight took off when a Cirrus Airlines Dornier 327 left for Mannheim. The last official landing was by an air ambulance flight Piper Cheyenne (D-ILCE). The final Cirrus aircraft departed the next day with a low flyby over the runway. The last aircraft to officially leave Tempelhof were Douglas DC-3 "Rosinenbomber" (Raisin Bomber) and Junkers 52/3m "Berlin Tempelhof" of Lufthansa, taking off on parrallel runways and wiggling their wings while heading for Berlin-Tegel. They were not the last aircraft to leave Tempelhof though: 3 aircraft operating under VFR had to wait until weather had improved sufficiently for them to leave the airport flying. Two were An-2 Biplanes (D-FBAW of MiniHansa and D-FWJC of Air Tempelhof) and one a Beech Bonanza, and they all left between 12:10 and 12:15 on 24 November 2008. 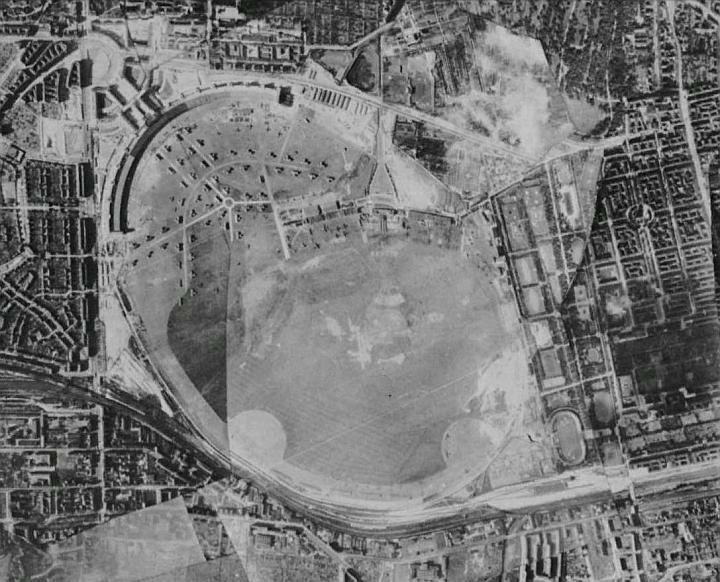 Tempelhof had been a safe airport: after the accidents during the Berlin Airlift (which were exceptional circumstances) only one deadly accident occurred when in 2001 a Bonanza crashed outside the airfield killing two. 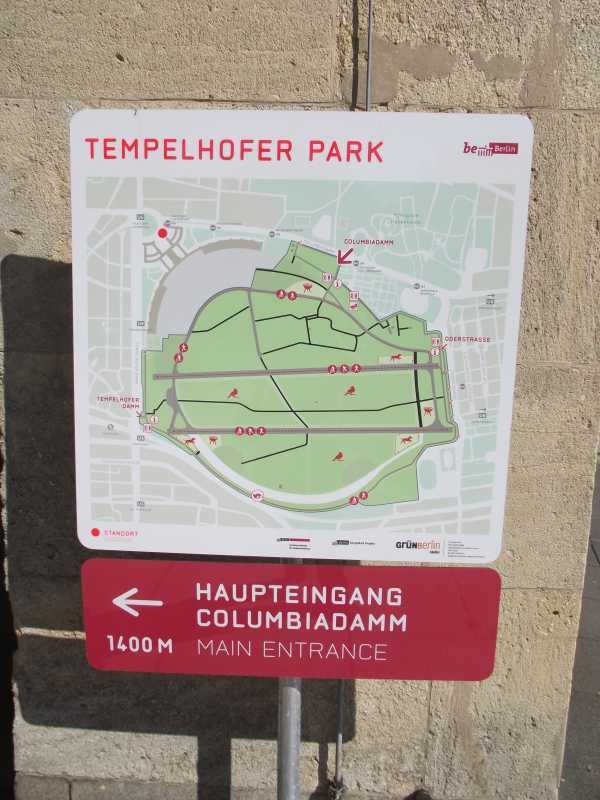 In June 2011 Tempelhof was still intact and renamed Tempelhofer Park. The main terminal building is a protected heritage site, so its future is safe. The hangars are still available, and wil be for the forseeable future, contracts have been signed with several parties about renting them. The runways are still intact and marked with large X's. 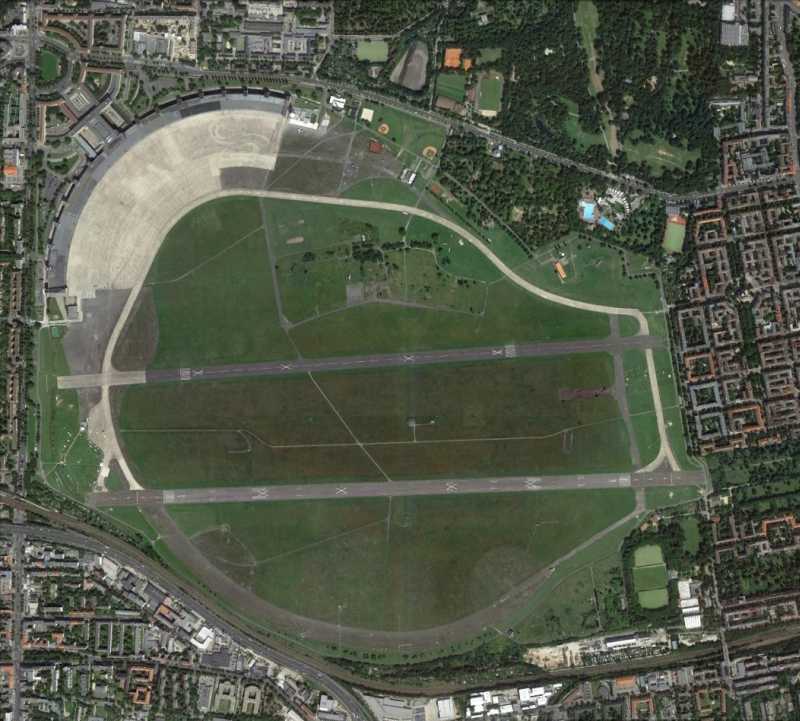 Berlin Tempelhofer Park in 2012, with large X marks indicating the airfield is closed. 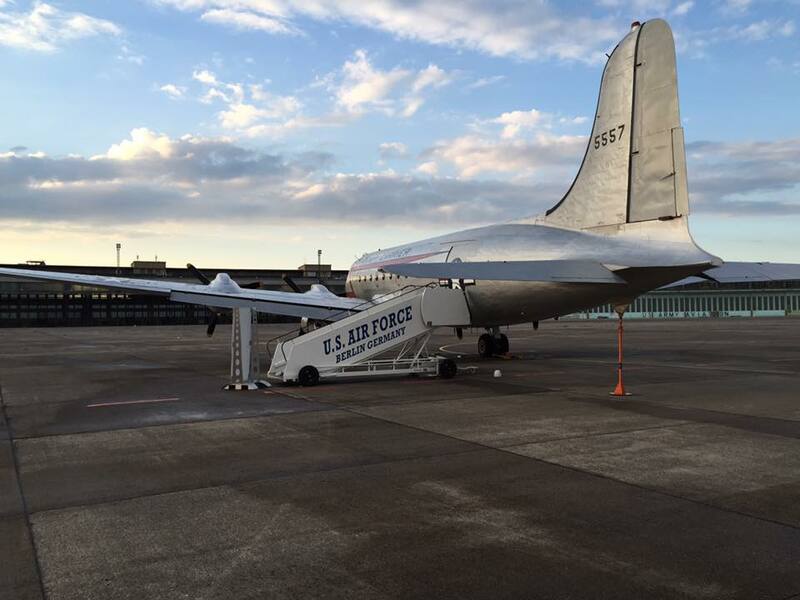 In September 2015, this C-54 'Rosinenbomber' was still parked on the Tempelhof platform as a reminder to the 1948-1949 Berlin airlift (photo C. Meijer). 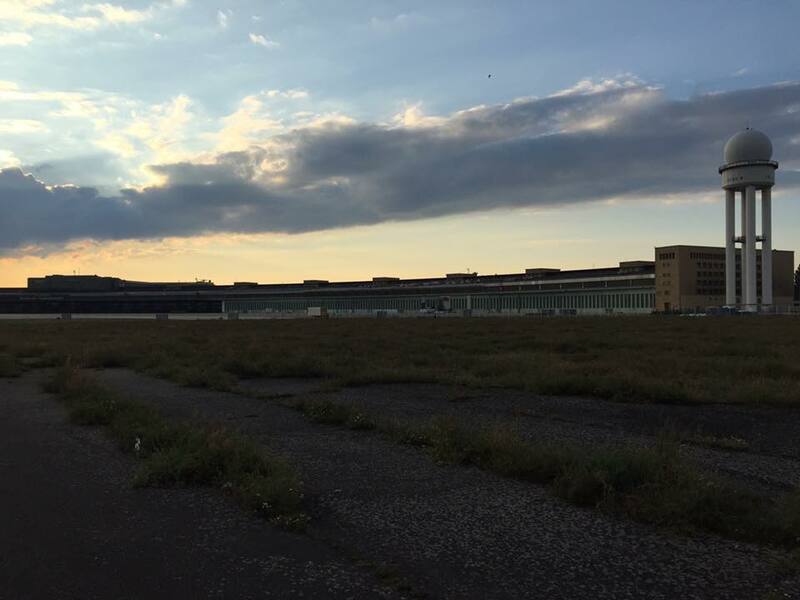 Airside front of the Tempelhof station building in September 2015 (C. Meijer). Pedestrians strolling on the northeast taxi track in September 2015. The radar tower can be seen on the left of the photo (C. Meijer).